Five hundred years ago, a terrible war almost extinguished humanity. Now the Terran Empire rises from its own ashes. Tasked to lead an exploratory mission, Commander Jared Mertz and his crew set off into the unknown. Only the Old Empire isn’t quite dead after all. With everything he holds dear at stake, Jared must fight like never before. Victory means life. Defeat means death or worse. 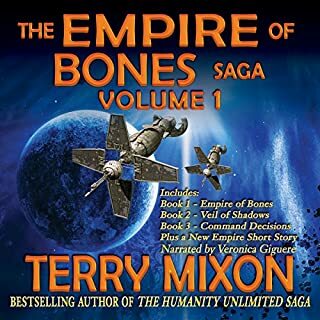 If you love military science fiction and grand adventure on a galaxy-spanning scale, grab Empire of Bones and the rest of The Empire of Bones Saga today! What made the experience of listening to Empire of Bones the most enjoyable? Would you be willing to try another book from Terry Mixon? Why or why not? What three words best describe Veronica Giguere’s voice? Clear, Formal, Lacking in variety. I think Veronica is probably more suited to Non-fiction. Was Empire of Bones worth the listening time? Like swimming in an inflatable pool. Fun at first, but soon you will find yourself wishing it was deeper. This book is written like the author has somewhere else to be. Everything plays out exactly how it has to to keep the plot barreling forward. I managed to make it 85% of the way through the book before I came to the conclusion, but as the first in a series it doesn't bode well. The story relies too much on coincidence and convenient timing. Things show up exactly where and when they need to be, as if the author wanted to make sure he was done in time for happy hour. Instead of taking advantage of small breaks to develop characters or world building, it bowls over downtime in leaps and bounds, describing hours of activity in single sentences. All the characters suffer from hive mind mentality, all agreeing with each other despite having wildly disparate perspectives. It results in all the bad guys being uninteresting and all the good guys being insufferably friendly towards one another at all times, even when there's good cause not to be. The author likes to insist instead of describe. The characters take the place of a live studio audience, loudly reacting to things in an attempt to get us to do the same, without letting us see why. There will be a statue. The characters will all remark about what a wonderful statue it is, the finest they've ever seen. They will leave, feeling fulfilled in their lives for having seen the statue. But we never get to see the statue for ourselves. We're expected to take it on faith that it warrants such reverence and adopt the same emotional attachment they do. The voice narration is decent. There's not a lot of range in character voices, just a couple variations in pitch and cadence, with a little too much Shakespearian inflection in parts. But a little of that is the fault of how they were written. I kept going through most of the book because the initial premise had merit, and because when things were progressing too smoothly I thought it was because it was setting up for the real story to hit us. But 6 hours in and I began to realize that there was no deeper plot readying to pounce on us. What we saw is what we got. And what we got was a little more soap opera than space opera. I just bought the next 2 books in the series! What did you love best about Empire of Bones? I received the first book in this series in exchange for a review, I asked to do this because I have been a fan of and listening to Veronica Giguere for years. I am so glad I did. This is creative science fiction, a compelling space drama with well developed characters and the science isn't in overkill mode. The only only reaction I had was Narrator based. The characters and voicing for them and their emotions was superb. However the general narration in between character speach was a bit rushed and faster than I tend to prefer. It also made the pitch a little high for my preference. (Kelsey's voice was a tad high as well) To solve this I just adjusted the speed of playback(to 50%) with the tools Audible provides to make things more to my listening preferences. All around great job Author and Narrator. I would Listen to another book from either. The story is a hero journey tale of two siblings who don't quite have a place in their society, when events out of their control remove the crutch of the expected paths of life and force this brother and sister to take a journey together to discover who they really are. 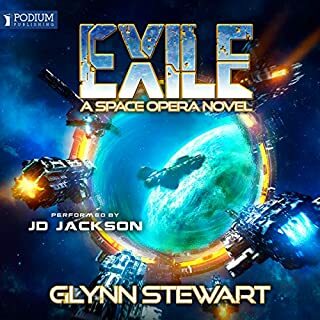 The story is Space Opera with some nice technology that is described very little but fits within the world well enough to believe. Things are told from a very character centered plot which has it's limitations. I would have like to get to know some of the other characters, but I suppose that's why it is a series and other will be developed in later books.The villain is interesting and presented well but has a very minor amount of the book. However they do have a major effect on the plotting of the book. Think monster movie where you finally get a good look at the monster in the closing act. This trope has served well in books and movies for years and does so here as well. "If it's not broke, don't fix it." I hesitate to call them "Techno Zombies", but this may be the best term without giving away too much. Just don't think horror!I enjoyed this story from beginning to end and will be continuing on with the series for as long as the writing and story stay solid. I would recommend this audiobook for many reasons. First, it is a great story with interesting characters. This first book hints at a bigger story, which has me eager to check out the next book. The audiobook is performed wonderfully, and I am very picky about this. If the narrator can't pull me into the story I will stop listening. What was one of the most memorable moments of Empire of Bones? The big rescue mission at the end. Veronica does a great job of making each voice sound distinct, especially where it came to narration. I don't like straight reads. I need the narrator to read it as a performance. Veronica Giguere does this admirably. When I was forced to stop listening, it was then the first thing I went to when I had time for audio. It even pushed back in my mental queue some of my favorite podcasts. Empire of Bones is the first book in a new and exciting series that opens up the Universe for grand storytelling. A mixture of royalty, bastards, and proper manners is the sauce where the characters marinade for the opening of this exciting new series. The only criticism I would have is that the story could use some more conflict within the political and social groups that are pushed together. This was minor for me, as I liked the court of manners and courtesy that the societies portrayed. I would just like more intrigue and political manipulations layered underneath those manners. Having just finished the audio book to Empire of Bones I felt compelled to share my opinion of it. It is 30 chapters long with each chapter taking about 15-20 minutes to get through on normal speed. I primarily listened during the hour-long commute going to and from work. The primary plot, which took some time to rev into as it felt reminiscent of a “no win” Star Trek training episode, focuses on the exploration of the galaxy long since fractured apart from the Terran Empire. This too felt strangely like they were about to undertake a five-year mission of some sort. A couple of chapters in, any similarity artificially created by myself or by the author ceases, as it takes a life of its own as I found myself fully vested in the story. 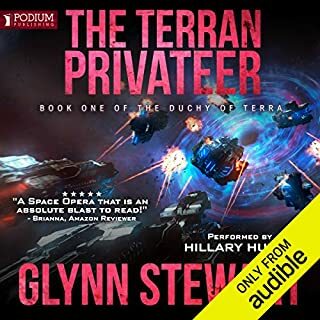 This was the third audiobook I have ever listened too and the first I have reviewed. This was my first female reader, or at least I thought she was female given the range of depth and pitch she was able to produce. All kidding aside she was by far the most pleasant sounding but given the minority from which I am grading her against I wouldn't read too much into it. Bias as it sounds there is a reason most automated systems designers elect to utilize female voices. Overall I would say I enjoyed to the point of purchasing the next two books in the series though I'm still not decided on it will be the audio or kindle reading edition. If all costs were the same I definitely do audio again but that is not the way things tend to work out. Final summary: Good listen(read) and recommended. And I thought Terry Mixon's other saga was great! I really liked Terry Mixon's other saga was terrific. The first book in his The Humanity Unlimited was kindly donated to me in Audible format. I loved that book, I consumed it, and then paid for the other two books in that series. 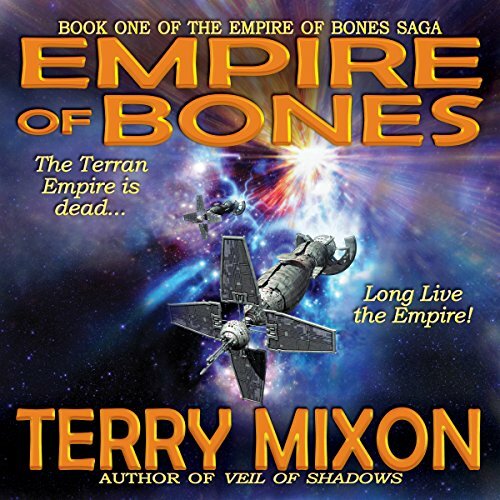 The Empire of Bones, first book was also donated in Audible format. It is just as good as the other series, but there are more than three books in the saga. I will also be purchasing those books till I have them all. I highly recommend this series. The only slight downside is, my 70 year old ears found it hard to hear the story at times. My fault, not the narrator's. Now for the obligatory: "I was given this free review copy audiobook at my request and have voluntarily left this review." the voice actor does have a lot of variation for her depository of voices. as such, the characters don't really have a lot of feeling in their voices. they have the same impression calm or in Tue middle of battle. on top of that, everyone seems too trusting. its like they've never been back stabbed, or double crossed, in their life. still, its an enjoyable read. just don't expect it to be very complicated. well worthy of the labours. needed for an enjoyable and brilliant addition to SIFI. Thank you. 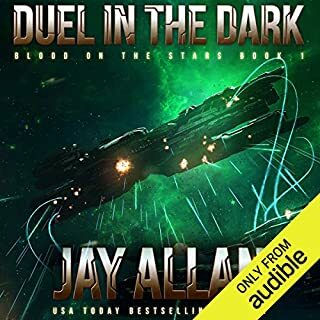 I really enjoyed this audio book, the characters are likable, the dialogue is free flowing and believable. 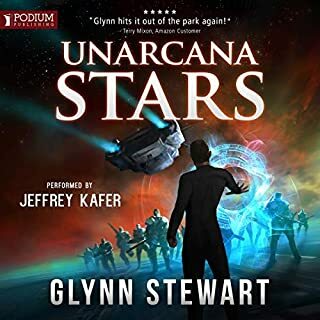 The setting of this story is based upon the remnants of an old multi-system empire getting back into space and exploring through flip points (Wormholes). The narrator is one of the best that I have listened to. 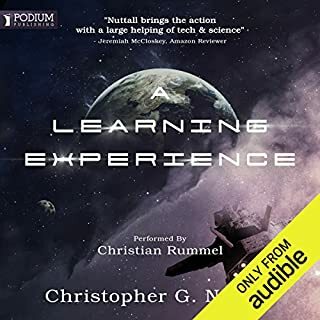 Even though I was given this audio book to provide a non-biased review I can truthfully say that I am looking to get the rest of this series.